Image: Rebecca Wanosik via Facebook. Facebook is at it again – policing (and even suspending) a person’s account because of breastfeeding shown in photographs. 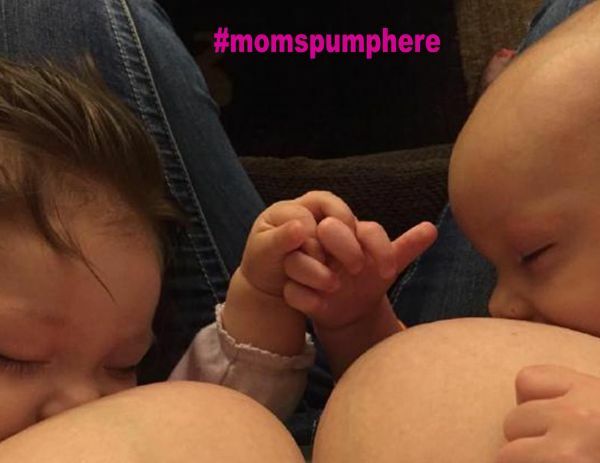 We’ve written about both topics previously on Moms Pump Here. Last year during one of our ad campaigns, we were not “allowed” to have a marketing campaign that showed a woman’s breast actually FEEDING AN INFANT. Can you believe that? We were angry and frustrated, but FB contended this was their policy about sponsored posts. Milk sharing and wet nursing is not new but we as a society need to move forward to normalize breastfeeding. Shortly after the post was made on Facebook, people began sharing the post and the picture associated with it. Then Ms. Wanosik’s husband Anthony posted that Facebook had deactivated her account (which has now been re-instated but FB is continuing to investigate. Critics of the photo commented that diseases and/or drugs can be passed through breastmilk and that the milk sharing should have occurred through an approved milk bank. We at Moms Pump Here applaud you, Ms. Wanosik – and we applaud the infant’s mom who knew the wonderful benefit her baby would receive from your generosity. We thank you both for helping us to normalize breastfeeding. We look forward to FB's response to the "investigation."